Shawn Giacobbe is a Board-Certified Physician Assistant (PA-C) who specializes in the evaluation and treatment of spine disorders. Shawn received his undergraduate degree from Dickinson College and his Master’s degree in Physician Assistant studies from Philadelphia College of Osteopathic Medicine. 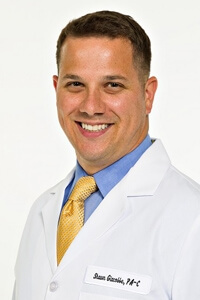 As a Physician Assistant at Towson Orthopedic Associates, Shawn’s skills are utilized both in the clinical setting as well in the operating room as a surgical assistant. He assists with surgeries and manages post-operative care at University of Maryland, St. Joseph Medical Center and sees patients at the O’Dea office. Shawn obtains 50 hours of Category One Continuing Medical Education credits per year. Copyright © 2019 Towson Orthopaedic Associates. All Rights Reserved.